Cool mornings - warm afternoons - yellows, oranges & reds dotting the hills - photographers around every corner - yup, Fall is here. And lest we forget the changes in the weather - cloudy and cool - sunny and warm! And just as I write this the skies have clouded up and the rain that was to come in Wednesday started dumping today with a bit of white up on Mt Haeckel - more than likely hail - you just never know - always pack that jacket! Finally, the catching part of fishing has returned. It started off slow this week, but by Saturday it had picked up. 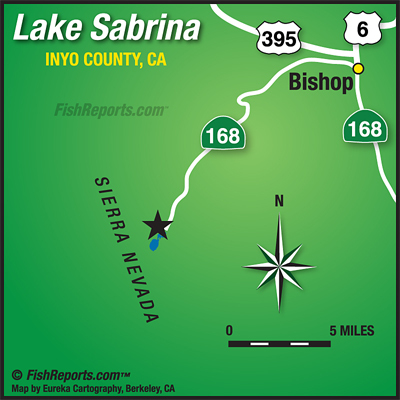 The fish have returned to the Inlets - fishing with jigs (Sierra Slammers), Salmon Eggs, or NightCrawlers. Trolling lures or NightCrawlers is also bringing in a few stringers. This week, fishing the rock piles was on the slow side as was shore fishing. Thanks to DFW for a Tuesday stocking. Paul Stanwyck of Bridge City, Louisiana, guided by Bishop local Len Taylor landed a nice 3-pounder trolling a NightCrawler and down five colors. Steve Moss and Bret Kirsch of Thousand Oaks found the bigger fish using mini-jigs - 2-3/4lbs, 2-1/4lbs, and a 2-pounder - we're thinking FISH-FRY! Andrew MacArthur of Torrance caught a 3-pounder using a Rainbow Rapala. Another FISH-FRY was happening at the Laguna Niguel Bucknam household with Steve and Jody bringing in a 2-3/4lbs, 2-3/4lbs, 2-1/4lbs and 2lbs using Salmon Eggs. The monsoonal weather is back with a chance of thunderbooms starting on Wednesday thru the weekend - so PACK THOSE PONCHOS! Temps are expected to be in the high 70s early in the week and then drop to the low 70s to high 60's by the weekend. Lows are to be in the low 40's early in the week and the high 30s toward the weekend. DON'T FORGET YOUR JACKETS! You can also check out www.weather.gov - enter Aspendell, CA (which is the little community right below Lake Sabrina) in the search field and you'll get the forecast for the higher elevation or take a look at Howard Sheckter, our local weather 'guesser' report at www.MammothWeather.com.